Polycystic kidney disease (PKD) is a genetic disorder characterized by the presence and progressive growth of cysts in the kidneys. Unlike the so-called simple cysts, PKD is not a benign disease and a large fraction of PKD patients are at risk of kidney failure, necessitating dialysis or a kidney transplant. When a patient learns about their diagnosis of PKD, the first question that comes up is whether it is treatable. Before we can understand what treatment could work to slow the disease down, a brief detour into the role of a hormone called ADH, or the anti-diuretic hormone (also known as vasopressin) is necessary. ADH helped life evolve from oceans to land, eons ago. If it weren't for ADH, many living organisms would be unable to withstand the harsh dehydrating influence of the warmer land surface under a blazing sun. Produced by a part of the brain called the "hypothalamus," ADH is a hormone that acts on the kidney and makes it retain and conserve water. It is what makes urine look dark and concentrated when you have not had enough water to drink or spent a day outside in the hot sun. It can, therefore, influence how much water needs to be excreted and how much must be "recycled" to meet our needs (depending on other factors, including our water intake and even the ambient temperature). How does ADH fit into the discussion on CKD? Studies have shown that ADH is one of the major promoters of cyst growth (the reason for kidney failure) in PKD. In other words, if you could somehow lower ADH levels, or block its action on the cysts, it might be possible to slow down cyst growth and the inexorable progression of PKD. Understanding the role of ADH helps in understanding the treatment options available and why they might work, from increased water intake to cutting-edge drugs. Increased water intake: As simple as this sounds, drinking water is an effective way to keep ADH levels down. ADH levels go up when you start to get dehydrated. This will set off the thirst response making you drink some water, which will lead to lowered ADH levels. In this case, the idea is to keep ADH consistently low by preempting ADH rise. It is postulated that this could slow the progression of PKD. How effective and meaningful that is in real terms is still debatable though. Managing complications: In the absence of other specific treatments currently available, we are limited to managing the complications of PKD. These include high blood pressure, kidney infections, kidney stones, and abnormal electrolytes. High blood pressure is treated using specific medications called ACE inhibitors or ARBs. Increased water intake might also help in reducing the risk of two other major PKD-related complications: kidney infections and kidney stones. Our understanding of ADH's role in worsening of PKD has led to promising research that could offer more concrete treatment options beyond the "band-aid" interventions described above. Current research is focused on finding drugs that could block the action of ADH and therefore prevent cysts from growing bigger (since cyst size increase is the crux of kidney failure in PKD patients). Tolvaptan: This is a medication that was originally approved for treatment of low sodium levels and acts by blocking the site (called the V2 receptor) to which ADH would normally attach to in the kidney (think of the V2 receptor as the "keyhole" to which ADH needs to attach, while tolvaptan is the "fake key" that when present will prevent that from happening). The well-publicized TEMPO trial has shown a potential clinical application for tolvaptan in slowing decline of kidney function in PKD. 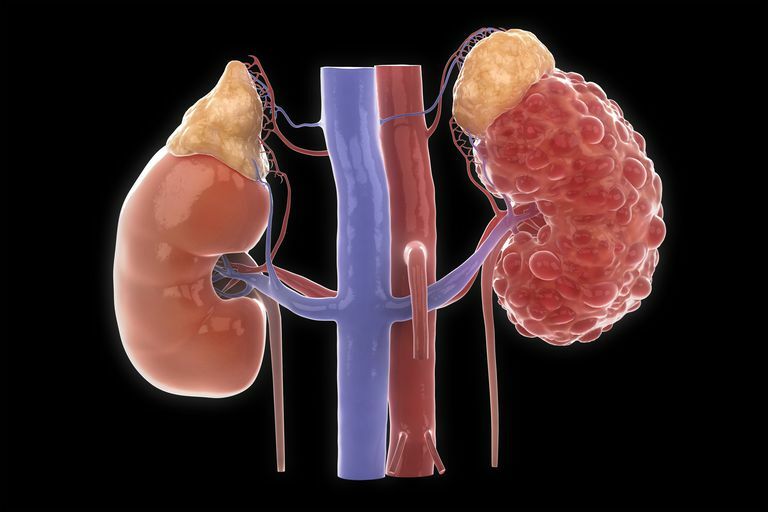 The mechanism appears to be slowing of the growth of the kidneys' volume, which leads to less kidney function decline over a three-year period. Tolvaptan, however, has not yet received FDA's blessings in the US for PKD treatment, partly because of concerns about its effects on the liver. It is already approved for treatment of PKD in some other parts of the world). Octreotide: This is a long-acting synthetic version of a hormone called somatostatin. A trial in 2005 first reported that a six-month treatment with somatostatin could slow cyst growth. Although we know that decline in kidney function in PKD follows cyst growth, the study stopped short of saying that slowing the cyst growth, in this case, would translate into clinically meaningful kidney protection. Then, in 2013 we saw the results of the ALADIN trial published in the Lancet. This study had a longer follow-up period than the previous studies and indicated a significantly lower kidney volume in patients treated with octreotide at one-year follow-up, but not at three years. Given the data we have so far, it appears that octreotide could have a potential role in the treatment of PKD. For some reason, it appears that octreotide slows growth in kidney volume over one year, but the effects become insignificant over the long term. Obviously, more comprehensive studies looking at long-term hard outcome data are needed. Although both these agents have shown promise so far (in addition to other contenders like mTOR inhibitors and other drugs in clinical trials), cost is a major concern. All other things being equal, octreotide could be a cheaper alternative than tolvaptan for what essentially could be a lifelong treatment. In 2017, a 30-day supply of (15 mg) tolvaptan pills is priced at $11,000 to $12,000 in the US, while 90 amps of octreotide (100 mcg injections) run $300 to $400. Nagao S, Kazuhiro N, Makoto K, et al. Increased Water Intake Decreases Progression of Polycystic Kidney Disease in the PCK Rat. J Am Soc Nephrol. 2006 Aug;17(8):2220-7. Epub 2006 Jun 28. Higashihara E, Nutahara K, Tanbo M, et al. Does increased water intake prevent disease progression in autosomal dominant polycystic kidney disease? Nephrology Dialysis Transplantation. 2014 Sept;29(9):1710-9. Caroli A, Perico N, Perna A, et al. Effect of longacting somatostatin analogue on kidney and cyst growth in autosomal dominant polycystic kidney disease (ALADIN): a randomised, placebo-controlled, multicentre trial. Lancet. 2013 Nov 2;382(9903):1485-95. doi: 10.1016/S0140-6736(13)61407-5.